Globally insufficient physical activity has been identified to be the fourth leading risk factor for global mortality, causing an estimated 3.2 million deaths worldwide. Though especially in high income countries, even in low-and middle-income countries (LMICs) physical inactivity is one of the ten leading risk factors for death. Physical inactivity is a key risk factor for non-communicable diseases and almost 80% of these non-communicable diseases occur in LMICs. Physical Activity is defined as any bodily movement produced by skeletal muscles that requires energy expenditure. Activities undertaken while working, playing, travelling, carrying out housework and engaging in recreational pursuits are included thereby. The WHO recommends for adults to do at least 150 minutes of moderate-intensity physical activity throughout the week. Compared to those who meet those criteria, people who are insufficiently physically active have a 20% to 30% increased risk of all-cause mortality. Speaking of LMICs refers to the World Bank Country Groups. For the current 2017 fiscal year, low-income economies are defined as those with a Gross National Index (GNI) of $ 1,025 or less in 2015. Middle-income economies are those with a GNI per capita between $ 1,026 and $ 4,035. Upper middle-income economies are those with a GNI per capita between $ 4,036 and $ 12,475, high-income economies are those with a GNI per capita of $12,476 and more. The Global Health Observatory is called the “WHO’s gateway to health-related statistics”. Its aim is to provide easy access to country data and statistics as well as WHO analyses to monitor global, regional and country situation plus trends. Global health priorities such as the health-related Millennium Development Goals are covered. Worldwide in 2010, 23% of adults aged 18 years and older were insufficiently active, among men 20% and women 27%. According to the WHO the highest prevalence of insufficient physical activity is the Eastern Mediterranean Region (31%) followed by the Region of the Americas (32%). On the contrary the prevalence was lowest in the South-East Asia (15%) and African (21%) regions. Across all regions, men were more active than women, with differences in prevalence between men and women of 10% and greater in the Region of the Americas and the Eastern Mediterranean Region. According to the level of income the prevalence of insufficient physical activity rose, so high income countries had more than double the prevalence compared to low-income countries for both men and women. In high-income countries 41% of men and 48% of women were insufficiently physically active as compared to 18% of men and 21% of women in low-income countries. For children and adolescents it is recommended to do at least 60 minutes of moderate- to vigorous intensity physical activity daily. Nevertheless, globally 81% of school going adolescents aged 11-17 years did not reach these WHO recommendations in 2010. School going adolescent girls were more passive than boys, with 84% of girls versus 78% of boys not meeting WHO goals. By far the lowest prevalence of insufficient physical activity (74%) showed adolescents from the WHO South-East Asia Region. Opposite in the Eastern Mediterranean Region, the African Region and the Western Pacific Region (88%, 85% and 85%, respectively) levels of insufficient physical activity were highest. In all WHO regions adolescent girls were less active than adolescent boys. Across income groups there was no clear pattern of insufficient physical activity among school-going adolescents. Thus the prevalence of insufficient physical activity was highest in upper-middle-income and lowest in lower-middle-income countries. Strong evidence shows physical inactivity increasing the risk of several major non-communicable diseases. It is estimated that worldwide physical inactivity causes 6% of the burden of disease from coronary heart disease, 7% of type 2 diabetes, 10% of breast cancer and 10% of colon cancer respectively. 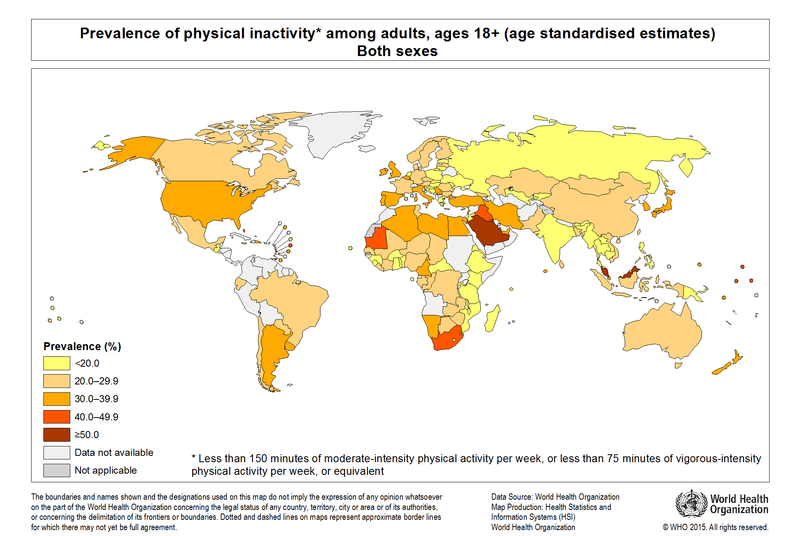 In total inactivity would cause 9% of premature mortality globally. As physical inactivity is associated with this range of chronic diseases it also provokes an economic problem. Conservatively estimated, physical inactivity cost health-care systems international $ 53,8 billion worldwide in 2013. Especially high-income countries bear a larger proportion of economic burden whereas LMICs have a larger proportion of the disease burden. Though research into correlates or determinants of physical activity has developed in the past two decades, it has mostly focused on individual-level factors in high-income countries. As low-and middle-income countries experience economic development, their occupational structure changes, which result in increased countrywide physical inactivity levels. With climate change, direct heat exposure raises and especially workers in tropical countries doing heavy labor (agriculture, construction, manufacturing without air conditioning) will be even more strained and their productivity will be reduced. Therefore by climate change physical activity will decline, particularly in tropical LMICs. It is confirmed that the epidemiological research into the health benefits of physical activity in low-and middle-income countries is consistent with previous research conducted in high-income countries. 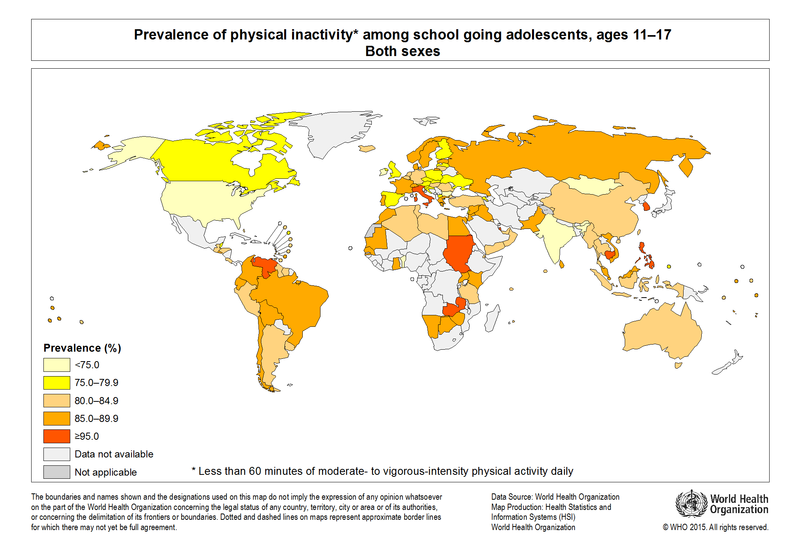 To increase physical activity levels globally population-based, multi-sectoral, multi-disciplinary, and culturally relevant policies need to be implemented. The WHO Member States have agreed on a voluntary global target for a reduction of 10% in physical inactivity by 2025. It is one of nine targets in the global action plan to reduce non-communicable diseases and improve mental health. LMICs specific strong evidence was found that multicomponent, school-based, and short-term (up to six months) interventions, which are primarily focused on adolescents, can promote physical activity in children and adolescents from LMICs. It would help to guide development of policies and programs to increase activity levels by a continued improvement in monitoring physical activity. The level of overweight among Tongans is one of the highest in the world with 94.9% of women and 89.2% of men being overweight. Because of a range of cultural and socio-economic factors, one of which is that sporting activities are often designed for and dominated by men, women in Tonga are more sedentary than men. The prize-winning “Kau Mai Tonga Ke Tau Netipolo” campaign uses netball as a tool to increase physical activity amongst women and girls to combat non-communicable diseases. It is a partnership between the Governments of Australia and Tongo as well as Netball Australia, through the Australian Sport Outreach Program (ASOP). ↑ 8.0 8.1 Atkinson K, Lowe S, Moore S. Human development, occupational structure and physical inactivity among 47 low and middle income countries. Preventive Medicine Reports 2015; 4: 40-5.